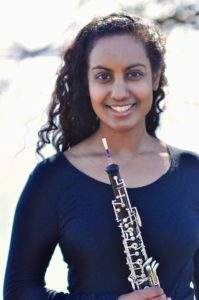 Oboist Bhavani Kotha enjoys a multi-faceted career as a soloist, recording artist, and orchestral musician. She recently was selected as a winner of the 2019 National Yamaha Young Performing Artists Competition. Bhavani has been featured as a soloist on several occasions, and she has won concerto competitions with the North York Concert Orchestra and the Hart House Orchestra in Toronto, Ontario. She is currently recording a solo album with Crystal Records and will be recording an album of Baroque and Classical oboe concertos next season with Centaur Records. Bhavani has performed in several symphony orchestras, including the Boise Philharmonic, Boise Baroque Chamber Orchestra, Kingston Symphony, and Toronto Concert Orchestra. She studied oboe performance at DePaul University, Glenn Gould School of the Royal Conservatory, University of Southern California Thornton School of Music, and the University of Washington.